Y'all know who I am. 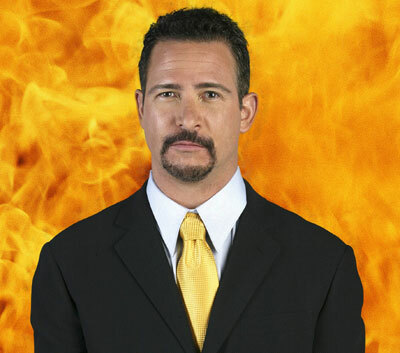 I'm the nephew of the great Jim Rome. Ok, that's not true but who cares. They call me Paul Rome, better known as the "awesome one". With a SCSU broadcast journalism degree in my back pocket and a year's experience of on-air sports at a small Minnesota TV station, the Romester knows sports and has lived the dream. I saw the highs and lows of sports in that short year. I got to interview MN legends Kent Hrbek and Darby Hendrickson, which was sweet. Paul Rome looked up to these guys as a youngster and can honestly say they are two really cool dudes. I also got to go in the Twins clubhouse after the Twins lost game 2 of the 2006 playoffs against the A's (the game Torii Hunter dove for the ball and missed, resulting in the game-deciding inside the park home run). That was a bummer and getting to see Randy Moss chew out security at training camp in Mankato is something I'll never forget. If you wanna know my favorite teams, I'm a homer so all hail the mighty Minnesota squads. My ego will never be in check regardless how much my teams struggle. Look at it this way people.....they say Minnesota fans are the most tortured in the U.S. Well guess what? It'll be that much sweeter when the Wild win the cup, or Kill takes us to Pasadena, or the Vikes finally bring Lombardi to the Twin Cities. I'm a die hard Gopher guy though I went to Cloud. The top two sports are football and hockey, but I love college bball and the Wolves have been entertaining for once. Baseball is too slow for my liking, but I will follow the Twins when I get a chance. Take a look at my two photos. That's me being all cool and stuff. Like the guy in the photos, I rule. That's all I want to say about myself for now, but believe me, it won't be the last time you hear me talk about my greatness. I am Paul Rome and I am out!!! !